The first thing I noticed when I sat down and saw this, was that it wasn’t five beers and food it was SEVEN beers and five courses of food. When we arrived Michael “Mafusa” Feruson introduced himself. He is the Director of Brewery Operations for BJ’s (so he helps make the beer) and he told us that we would start out (while waiting for everyone else to arrive) with a glass of BJ’s own Nutty Brunette. You’ll notice this ISN’T on the menu. Yes, that is right, what I thought was a five course meal with beer has turned into five courses of food with EIGHT courses of beer. Each beer we got was in a small glass, probably three to four ounces of beer in each glass. 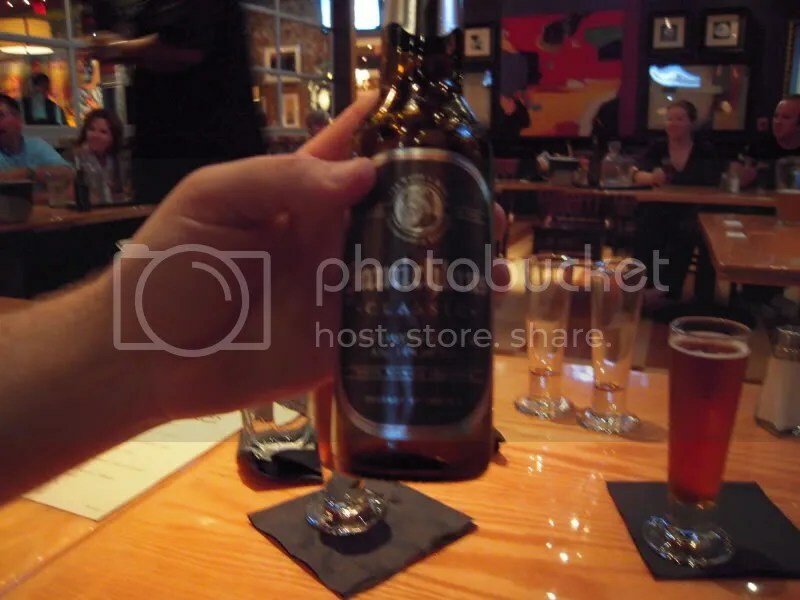 The first “real” course was the aperitif beer course of Samuel Smith’s Winter Welcome. This beer was a nice deep copper color with a nice head. It tasted of malts and nuts with a little hint of “winter” spices. I am a pretty big fan of “hoppy” beers like I.P.A’s, but this was very refreshing. The best choice as an aperitif? Probably not, I would have liked to start with something lighter. First course of food was BJ’s Chicken Pot Stickers. The dipping sauce is AMAZING! This was served with Fuller’s Vintage Ale. Another deep colored beer, possibly a little more orange-ish tinge to this one. 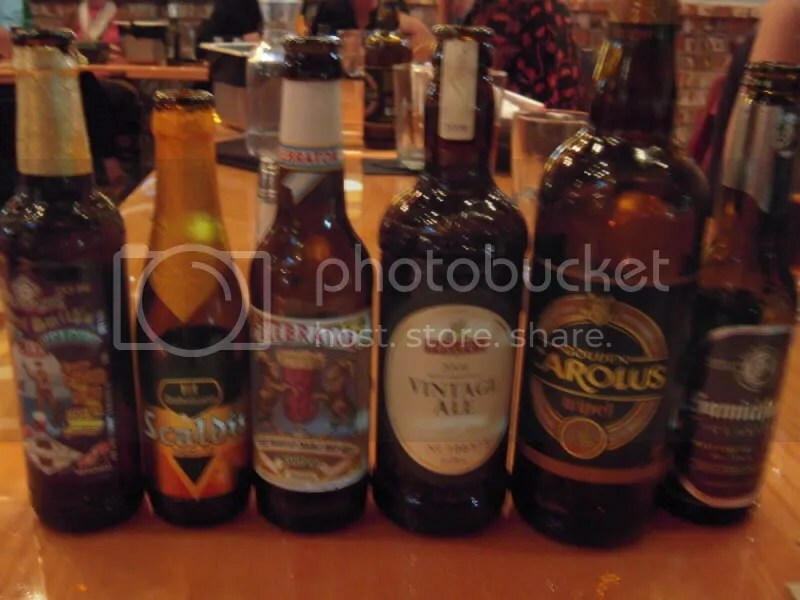 This was another beer (as most of these were) with some of the “winter” spices like cloves. This beer had a WONDERFUL balance between the hops and malts to make an amazingly smooth beer. This beer comes in at 6% ABV. The second course was BJ’s Garden Medley Salad that actually has its dressing made with the Dupont Avec Bons Voeux, the beer we were SUPPOSED to have. Unfortunately they did not have enough of this beer so another was substituted. The salad is such a wonderful salad with a little bit of everything in it. If I could, I would have licked the plate! Gouden Carolus Tripel was substituted and this beer was a meal unto itself. The beer was a lighter yellowish, looking very similar to American beers, but boy does it hit you when you drink it. A very strong strong bite at the beginning let you know that you were getting alcohol. Nice balance in the finish, but definitely not a light weight beer! The third course was BJ’s famous Sweet Pig Pizza. 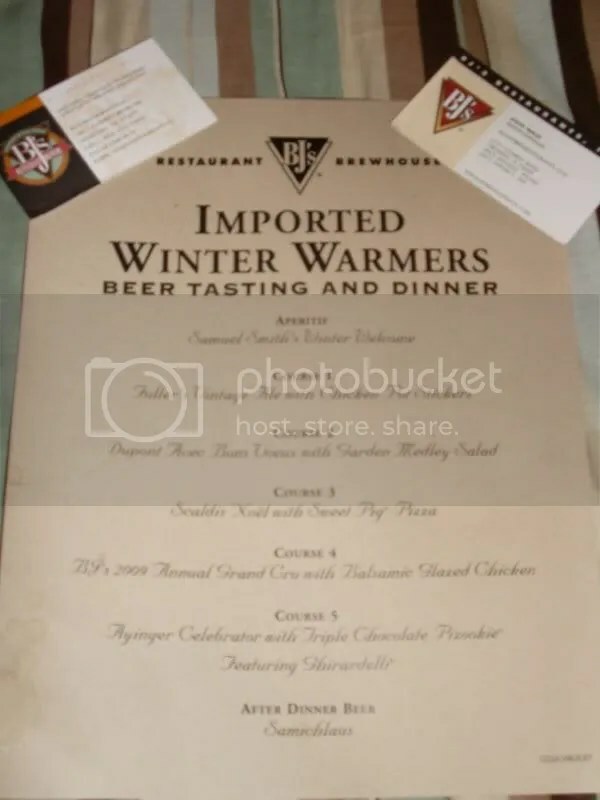 I’ll take a moment to point out that BJ’s old logo (on the business card on the left in the pic above) prominently featured “Chicago style pizza” and while the logo no longer does, they still do. They have WONDERFUL deep dish pizzas and the Sweet Pig is no exception. This was served with Scaldis Noel. The Scaldis Noel (called Bush Noel overseas thanks to Anhueser-Busch in America) was strong, weighing in at 12% ABV. This was another spicy, malty beer that was light enough to not weigh you down, but strong enough to keep you from downing it. The fourth course was BJ’s Balsamic Glazed Chicken with mashed potatoes. The chicken was perfectly down, nicely flavored and succulent. This was served with BJ’s 2009 Annual Grand Cru, on draft only. This beer was one of the favorites of the night. A very complex beer with some fruity and hoppy flavors but still had some nice spiciness. Paired the balsamic glaze perfectly! The fifth course (dessert!) was BJ’s Triple Chocolate Pizcookie featuring Ghirardelli. WOW, let me say that again. WOW! This was an amazing dessert. Chocolate on chocolate ice creem on a chocolate Pizcookie (a dessert cookie/pizza) with an extra Ghirardelli dark chocolate square. This was an amazingly rich DARK chocolate dessert that probably killed my diet for the week. This AMAZING dessert was served with one of the weakest beers of the night, the 6.5% Ayinger Celebrator. 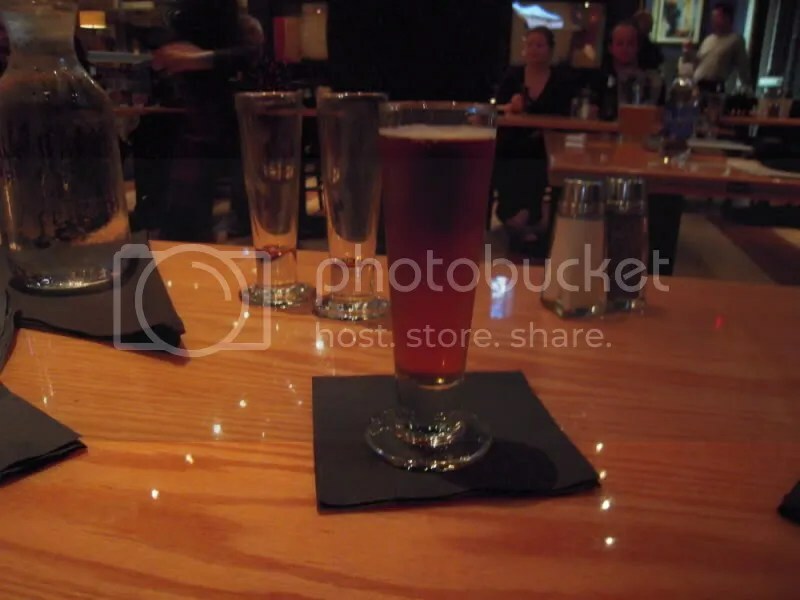 This is a Doppelbock (note Wikipedia’s pic is of the Celebrator) and bubbled like champagne. The light tight bubbles in the head never faded away and left amazing lacing down the glass. The only drink I’ve ever seen bubble like this is champagne. This beer was rich with a caramel sweetness with a hint of bitter hoppiness in the background balancing it out. Great pairing. The final beer was the after dinner beer, though I may have considered it a meal unto itself. Samichlaus weighs in at an insane 14% ABV and was thick, almost syrupy, semi sweet beer. I believe the syrupy nature comes from the high alcohol content not being able to hold the carbonation. The name literally translates to “Santa Claus” and is a European winter beer. According to the Guinness Book of Word Records it is the strongest beer in the world. I managed to finish it, though it wasn’t easy. Overall, this was an amazing experience and I was pretty tipsy so I apologize if my tasting notes aren’t the best. It was also pretty difficult to keep all nine beers straight in my head so I could relay this to you all. I really recommend everyone out there try new things. Try new beers! Try new food! Americans have gotten used to really crappy beer and just around the corner are some of the best beers in the world! Go taste them all! I’m trying to!